Hillary Clinton has faced a number of double standards, from her days at Yale Law School to her years in the White House as the iconic pants-wearing first lady. Yet running for president as the first woman to win a major party nomination brings its own set of sexist attacks — especially when you're running against someone like Donald Trump, who has inspired an incredibly vocal base of Americans frustrated with what they deem "political correctness." And for Clinton, the double standards keep coming in the strangest ways. Trump supporters have attacked Clinton for her recent "basket of deplorables" comment, made at a New York City fundraiser on Friday, Sept. 9. In her remarks, Clinton said she places about half of Trump supporters in this "basket," and admitted that it was a generalization. But, the Democratic candidate added: "They are racist, sexist, homophobic, xenophobic, Islamaphobic — you name it." If you scroll through the #BasketofDeplorables hashtag, you'll see hundreds of tweets from Trump supporters turning the phrase into a positive affirmation. They name-drop organizations like Planned Parenthood, people like Khizr Khan, and still question President Obama's birthplace. Even Trump's own campaign spokesperson, Katrina Pierson, engages in unabashed racism. Some Twitter users have dug up a tweet from Pierson from 2012, in which she laments the lack of "pure breeds." There's certainly an argument that Clinton and her campaign should take the high road and not engage with Trump and his virulent voter base. But is it wrong for Clinton to show that she doesn't stand on the side of racism, xenophobia and misogyny? It's not like Clinton hasn't experienced these attacks personally; there are very dangerous consequences stemming from this rhetoric. As a woman, the attacks from right-wing voters are not just amplified, but entrenched in the long history of violence against women, and the dangers are real. In August, Trump suggested at a rally in North Carolina that the "Second Amendment people" could take care of Clinton if she were elected president. While Trump's comment was made with his trademark nonchalant air, many thought it was at once a threat to Clinton and a call to action — violent action — for his supporters. What would happen if Clinton made a similar remark about Trump? Those "Second Amendment people" would, likely, come after her. 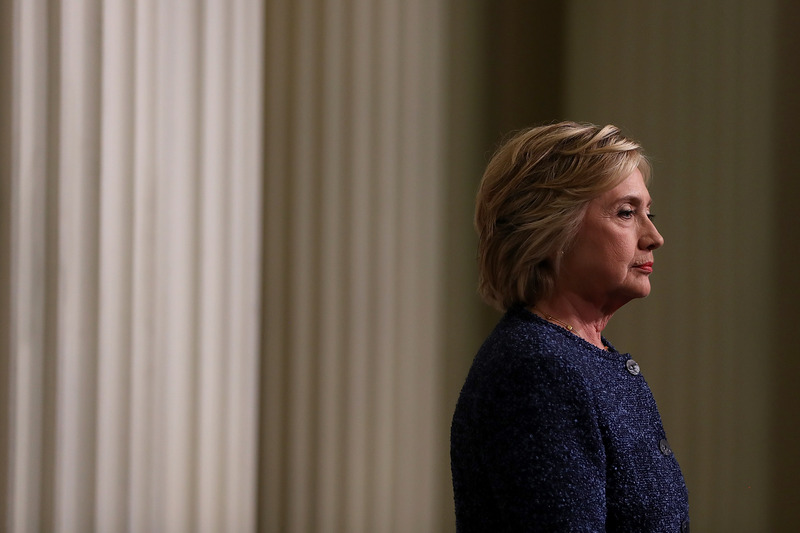 Clinton has the right to defend herself against Trump's rhetoric and the damaging ramifications it may yield. She also has the right to say she won't be the victim of violence and that ordinary Americans shouldn't be, either. But as Clinton highlighted on Friday, denial and anger are currently stronger forces in America than diplomacy.